6-8 Cookies~Build your own cookie collection, choose up to 3-4 flavors, and your designer box wrap! Share this product and receive a $0.75 sharing discount. The Sweet Treat is a great gift that is just the right size and budget for any occasion for under $30.00. Flavors Available Now for Your "My Way Collection." Almond Toffee Chip: A cookie and candy in one by combining buttery toffee, Guittard semi-sweet chocolate chips, and toasted almonds make this creation exclusively Blue Chip. A fabulous dessert! Black & White: White chocolate chips mixed with our signature Oban-infused dough that offers a sweet and delightful profile. This one people remember from California, so unique. Blue Chip Joy: A marriage of almonds, coconut, and rich Guittard semi-sweet chocolate chips comes together for a whimsical delight. A must for cookie lovers everywhere. Blue Chip Royale: Take almonds, toffee brickle and creamy white chocolate chips, and you've got an imperial tasting cookie fit for kings and queens. Chocolate Chip: The big kahuna, the grand slam, the most incredible chocolate chip cookie you will ever taste. This cookie is the one to stand the test of time. Yummy to the last bite and our customers have voted best cookie in over ten cities. Chocolate Chip Macadamia: Semi-sweet chocolates with Hawaiian macadamia nuts shipped from the big island! Aloha! Chocolate Chip M&M: A colorful chocolate chip cookie combined with the famous Mars candy. Each cookie baked with seasonal M&M's throughout the year. Chocolate Chip Walnut: Our famous chocolate chip cookies baked with walnuts for a crispy, crunchy, nutty delight. What makes a good thing better? More good things. Cinnamon Delight (Snickerdoodle): Our sugar cookie infused with cinnamon and spice that has a profile that’s light and airy with great flavor. A favorite for many! Snicker-snap-snicker-doodle. This light and delicious cookie, coated with pure cinnamon, is a "Sinful" creation! Lemon Delight: Our sugar cookie dough infused with lemon zest, and extract, light and airy! A melt in your mouth temptation, not too tart and not too sweet, like Grandma's sugar cookies but with real lemon zest. Oatmeal Chocolate Chip: We take our Oatmeal recipe and add chocolate chips to it! Oatmeal Raisin: Fresh oats, raisins, sprinkled with a touch of coconut makes Blue Chip's Oatmeal Raisin the best in the country! We can add walnuts if you request. Peanut Butter: Our signature dough married with premium creamy-smooth peanut butter for that rich peanut-buttery goodness. Peanut Butter Surprise: Milk Chocolate in a peanut butter cookie! Sugar-Plain and Simple: Tasty & delightful- an old-fashioned favorite! Sugar Iced: Sugar cookie with Buttercream Icing! Sugar with Seasonal Sprinkles: Favorite amongst our younger fans and those who are young at heart, our sugar cookies coated with seasonal sprinkles for that perfect treat. White Chocolate Chip: Guittard white chocolates replace the semi-sweet and become the centerpiece for this light, creamy, and delicious cookie. White Chocolate Chip Macadamia Nut: What Blue Chip Cookies is known for across the country. "The first bakery to introduce the White Chocolate Chip Macadamia to the public. Our very own creation dates to 1982. This buttery rich cookie with white chocolate pieces surrounded by macadamia nuts is truly decadent. Warning: this cookie may be habit-forming. Serving Suggestion: 2 cookies /person, one for lunch and one for dinner. For Pure Cookie Joy! Our cookies have no preservatives, so we want you to receive your cookies within 2 shipping days. Each cookie is packaged 2 cookies to each Blue Chip Cookies’ proprietary cookie bag, same flavor so we don't mix in other flavors. Freeze for the Future: We make it easy to store safely and maintain freshness for up to 6 months when stored in the freezer right in their cookie bag. We recommend you leave them in the bag and freeze, to maximize freshness. Do not refrigerate. Take your cookies out of the freezer 15-20 minutes prior to serving to defrost. You can take them from freezer to microwave, remove from their bags, and heat for about 12-15 seconds to serve them "fresh out of the oven." Order by 2 pm EST Monday-Thursday, we will get it out that day! We ship Monday through Thursday for arrival Tuesday through Saturday (unless it’s a FedEx holiday). Additional questions please review our "Shipping Policy" on the right side above the shopping cart area. Planning for the future? No problem. Orders can be placed up to 90 days in advance! Nut Allergy Notice: Due to our cookie baking and handling process, all our products and baking, packaging team may come in contact tree nuts or nut oils. Please be aware of this if you have any allergic reaction to these products. All products have major food allergens (wheat, milk, soy, eggs) and are baked with exposure to Tree Nuts/Peanuts. From Lang Financial of Cincinnati, Ohio on 10/15/2015 . From Tai-Assent of Ottawa, Ontario on 6/16/2015 . 2/1/2019 – Hello there -- I'm curious what this statement means: "We now have EVERYDAY BEST PRICING WHICH INCLUDES SHIPPING & HANDLING." . . . Response From Blue Chip Cookies Direct: Upon analysis of our business and a survey we did in May-August 2018, our customers told us that they really wanted the cookie prices not to fluctuate. Blue Chip Customers tend to want to order often...We also analyzed and realized the up and down of price and the variances in coupons were driving inefficiencies and driving costs up actually, so by taking them out of the equation, focusing on quality and service, just giving the customer everyday best pricing they could rely on, people could buy Blue Chip Cookies anytime and know they were getting the best price for gourmet cookies and we could drive costs down. We also want to focus more on our cookies, our reputation of being the best cookie! 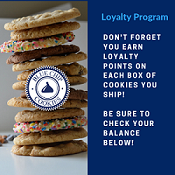 We added a loyalty program rewarding purchases, customers love that. 4/12/2017 – What Allergies associated with Blue Chip Cookies? Response From Blue Chip Cookies Direct: Nut Allergy Notice: Due to our baking and handling process, all of products and team of bakers come into contact with tree nuts or nut oils. Please be aware of this if you have any allergic reaction to these products. All cookies have major food allergens (wheat, milk, soy, eggs). 12/10/2015 – I want a Thank You themed box - but an assortment for 4 or 5 different types of cookies - how do you order that? Response From Blue Chip Cookies Direct: Thank you! With the holiday season the everyday boxes we have are harder to find. Simply go to the "MyWay Assortment (Create Your Own) and select the MyWay Cookie Assortment Gift Box. You can select up to 6 flavors and then select the Thank You Box. 2/13/2014 – What is the Nutritional Value of a Blue Chip Cookie? Response From Blue Chip Cookies Direct: Although we have over 35 cookie variation we have found that the nutritional values are very similar for our all cookies, with exception of iced cookies. Please visit our main site and look at nutritional values in the footer. 2/5/2014 – How many cookie flavors do you have? Response From Blue Chip Cookies Direct: We actually have over 40 varieties and we add cookies flavors all the time. If you have an idea, let us know. Look under single flavor assortments or review the information of all the current cookie flavors under the Ingredient tab.